Touring Panama with the "Mini cruise ships"
Nobody seems to talk about them nowadays, but the little cruise ships still ply our coasts. They offer an experience quite different from the giant cruise ships. The 80 or so passengers per ship enjoy more sociability and learn more of the culture and ecology of the country. The ships come and go, usually spending the northern summertime in Alaska, Washington or Canada. One of these is “Amazing Grace” operated by Windjammer Cruises. Another is “Sea Voyager”, of Lindbladt Expeditions which is usually based in Baja California, Mexico. 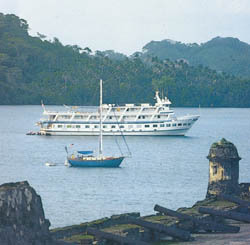 The “Pacific Explorer” operated by Cruise West will also be heading to Panama come the dry season. All of these are represented in Panama by C.B. Fenton Company. The passengers fly to Panama to join the ships and spend a night in a hotel before and after their cruise. Many decide to stay longer to enjoy the city or tour the interior. Some of the little ships used to show their passengers destinations on both the Caribbean and Pacific coasts, but nowadays economize by avoiding the Canal transit, which is a pity because two oceans plus a transit was an attractive offering. Private yachts and sailboats which have always passed by or through Panama on their way around the Caribbean or the Americas, are now not only regarding Panama as a destination, but are staying here for longer periods. The yachts come from the east and west coast of North America, from Europe and many other places in the world. Whether transatlantic or trans-Pacific, Panama pretty much has to be on every boat’s itinerary. They are bound for the Galapagos Islands, the Caribbean or anywhere else around the vast and diverse continents of North and South America which Panama unites. They stay in Bocas del Toro, Colon or San Blas on the Atlantic side and Panama City on the Pacific. Mr. Felipe Argote manager of Abernathy, the sports and marine store which has a branch on Amador Causeway, says that yacht owners are choosing Panama not only because of the high costs, including insurance, of keeping their vessels in U.S. marinas, but because now, Panama offers them most of the spare parts and sundries which they need. Evidence that Panama caters to yachtsmen can be seen in our advertisers index, where you will find Match Shipping an agent specializing in yacht transits through the Canal. Panama is also out of range of the hurricanes which pound the Caribbean and the East Coast of the USA between June and October. There are many facets to specialized tourism. Here in Panama, where tourism has never been strongly exploited, we are only just beginning to realize the extent of the interests to which we can cater. Take butterflies for example. There are thousands and thousands of butterfly buffs in the U.S. They have their own magazine “North American Butterflies”. In Arkansas, there is an International Butterfly Festival. Butterfly watching is featured in Tennessee tourism promotion. In London, Butterfly House at Syon Park lets visitors walk among hundreds of the free flying creatures. Auckland claims its Butterfly House is the biggest in the southern hemisphere with 700 tropical butterflies. Venezuela offers a ten day B-watching tour to many different parts of the county. Even Scotland has an organization called Butterly Conservation which is holding workshops for visitors this year. Amarillis Blue skipper -- a rare find. Neighboring Costa Rica has Butterfly Farm which breeds the insects for export live to England and other places. It has a staff of twelve and is an established tourist attraction. So what are we doing about butterflies? Well, Colleen Lal, Canadian newcomer who, with her husband Raideep, is developing the Cielo Paraiso golf and residential project in Boquete, has comissioned a local naturalist to make a study and has an album bulging with photos showing the species which can be observed in the area, including a rare specimen, the Amaryllis Blue-skipper which has never been seen before north of the Amazon Basin. We do not know whether the butterfly watchers come just with cameras, or armed with nets, formaldehyde and pins to take their trophies home. Perhaps some butterflies are on the endangered list. We will have to do more research. Tocumen Airport’s terminal, built in 1970 is in the process of a US70m facelift and expansion. To face the challenges of Panama’s growth, especially in tourism, the Government handed the airport over to a private sector-government consortium two years ago. The present works add 20,830 sq meters of internal circulation and commercial areas and 22 boarding tunnels. View of the terminal's new look. A lot of interest is being shown in Coiba, Panama’s largest island, which lies at the heart of the Coiba National Park, an especially rich marine habitat, which has now been declared a World Heritage Site. In the early days of the 20th century before “ecology” and “conservation” became household words, the Panamanian Government established a penal colony on the island since its surrounding waters teemed with saw-tooth deterrants to would-be escapees. The Colony recently moved to another location so that advantage may be taken of the islands rich eco-tourist potential and so that neither tourists nor wildlife be frightened by the inmates. 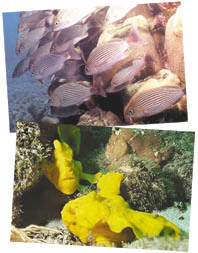 The rich undersea world of Coiba. Divers say the waters around Coiba and the Gulf of Chiriqui make this one of the world’s top locations for adventure diving for big fish and mammals. 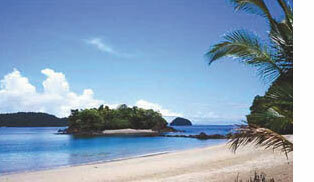 A diving company, Scuba Coiba, specializes in the area. The UNESCO committee which met in Durban, South Africa, in July made the following observations: “Coiba National Park, off the southwest coast of Panama, protects Coiba Island, 38 smaller islands and the surrounding marine areas within the Gulf of Chiriqui. Protected from the cold winds and effects of El Niño, Coiba’s tropical, moist forest maintains exceptionally high levels of endemism of mammals, birds and plants due to the ongoing evolution of new species. It is also the last refuge for a number of threatened animals such as the Crested Eagle. The property is an outstanding natural laboratory for scientific research and provides a key ecological link to the Tropical Eastern Pacific for the transit and survival of pelagic fish and marine mammals”. Fortifications on the Caribbean Side of Panama: Portobelo, San Lorenzo (1980). Darien National Park ( 1981). Talamanca Range, La Amistad Reserve, La Amistad National Park (1983- 1990). Archaelogical Site of Panama Viejo and Historic District of Panama (1997- 2003). World Heritage is the designation for places on earth that are of outstanding universal value to humanity, to be protected for future generations to appreciate and enjoy. Places as diverse and unique as the Pyramids of Egypt, the Great Barrier Reef in Australia, Galapagos Islands in Ecuador, the Taj Mahal in India, the Grand Canyon in the USA, and the Acropolis in Greece are examples of the 788 natural and cultural places inscribed on the World Heritage List to date. Sites also benefit from the elaboration and implementation of a comprehensive management plan that sets out adequate preservation measures and monitoring mechanisms. In support of these, experts offer technical training to the local site management team. World Heritage membership also brings an increase in public awareness of the site thus also increasing tourist activities. When these are well planned for and organized, respecting sustainable tourism principles, they can bring important funds to the site and to the local economy. A key benefit of ratification, particularly for developing countries, is access to the World Heritage Fund. Annually, about US$4 million is made available to assist in identifying, preserving and promoting World Heritage sites.